The first issue of Mania that Moth & Tanuki appeared in is now off sale, as the new issue is out (more on that soon). 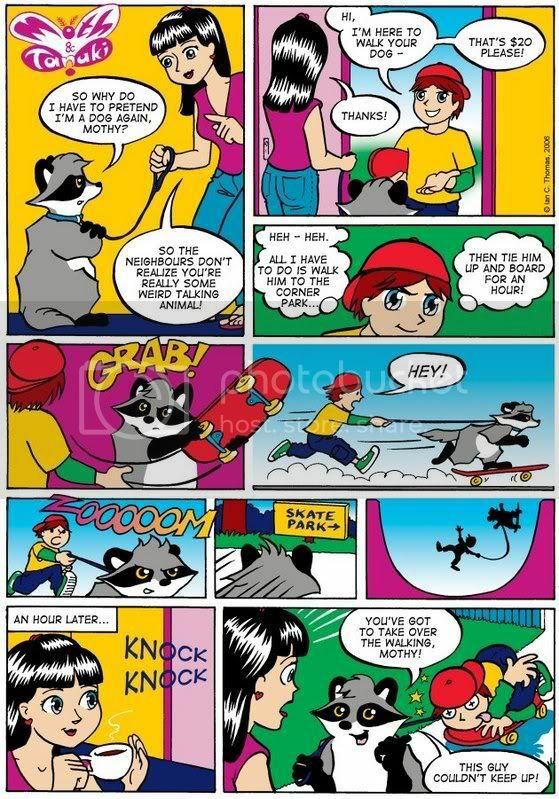 One of the two page stories in that January issue is Sk8brd Tanuki, which was originally drawn for submission as a one page strip. Doing different versions of the same story is strange, as drawing comics is about trying to create definitive images telling a story - getting the pictures arranged and the lines cleanly placed in the best way possible. So this version is probably not definitive - it's less detailed with less panels than the published one (you needed to buy January's Mania for the longer one) - but here it is. i like the red in it! i had a laugh on this one. funny! Thanks, Isay! Nice pick on the red - I don't usually use it, as most of my colour schemes use non-compatible colours, but I have in a few of these strips lately.